Is it OK to borrow from your kid's piggy bank? Mike Hall brings up a delicate subject which may get you thinking about your children's financial future. There's a wide range of feelings on the subject of borrowing from your children. Some parents see it as morally reprehensible, akin to stealing from the needy. Others see it as a normal practise in a family that supports each other. An article in Time magazine states that between 30-50% of parents take money from their children's piggy bank or savings account. Of these parents, around half said they did not feel guilty, and around half never pay the money back. An argument in favour of borrowing from your children, is that it can be considered your money. A child's savings are often mostly made up of money given to them by their parents, and while you are their legal guardian, you're responsible for everything they own. The age of the child is obviously a factor. 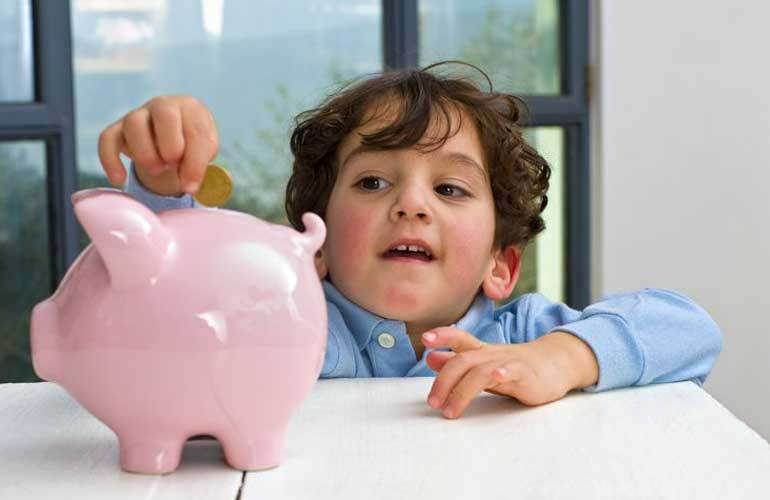 Often parents start saving for their children at an early age. If your child is too young to understand money, then it wouldn't really be possible to discuss borrowing with them. If your child is in primary school or older, you could ask for their permission before borrowing the money. It's more honest than just taking it, and they will understand what has happened to the money if they are looking for it. However, you will have to respect their decision, even if you are refused, or you are teaching them the wrong lesson, and they won't feel guilty about taking money from you without permission. If you get your child's permission to borrow their money, you can discuss remuneration to incentivise the deal. They might be more than happy to let you have the money, but why miss the opportunity to teach them a bit about personal finance management, an important part of life that is sadly underemphasized in their school education. If you are borrowing pocket change, it will easy to pay back more than you borrow. If you need £2, you could pay back £2.50 the next day, or £3 at the end of the week. If you are borrowing a larger amount, like from a savings account for their future, then you could look into how much it would cost to borrow the same money from a short term cash loan company, and pay your child something similar. It will stop you from relying on borrowing from them too often, it will teach them how borrowing and lending works in the real world, and surely you would rather this money go to your child's future instead of a loan shark. If you often find yourself short on change, and needing to borrow small amounts from your child's piggy bank or money box for small purchases, then perhaps there's a better solution. With £10 of change from the bank and a few small notes, you can create your own petty cash box. Put your spare change into the box when you have some, and try to refill it if it gets low. This avoids any conflict or mixed messaging for your children. If you find yourself regularly having to borrow money from your children's savings account, there is likely something wrong with the way you are managing your finances. You should have savings of your own to borrow from, or at least a buffer amount in your account for unexpected payments. Using Money Dashboard you can easily view and sort your monthly income and payments and set a budget to stick to. If it doesn't leave you with a small amount to put into your savings, after paying off your monthly bills and debt repayments, then you need to consolidate your debts into a lower monthly payment, or scale back your lifestyle. There are lots of tips on how to save money on the Money Dashboard blog. Pocket change is one thing, but if your children have more spendable wealth than you do, then something isn't right. If you need to take the money back off them before the month is over, then you are paying them more than you can afford to.